The U.S.-based car rental giant Enterprise, which has the largest fleet in the car rental industry with around 2 million vehicles in 95 countries, has said it eyes a threefold growth in Turkey over the next five years. The company, which also signed an important agreement with the national flag carrier Turkish Airlines (THY), is said will invest around TL 1 billion ($210 million) in the country this year. Enterprise Global Chairman Andrew C. Taylor said Turkey was a very important market for the company. "We see Turkey as a very important and attractive market. Our cooperation with THY also supports this. We are very pleased to be here and because of our partnership with the Turkish Airlines," he added. Turkish Airlines and Enterprise Holdings signed a three-year agreement in October last year. Within the scope of the agreement, Turkish Airlines passengers can easily rent a car from the Enterprise, National and Alamo brands through the official website of the flag carrier. The world's largest car rental company initiated its operations in Turkey in July 2014 and is being operated by the Turkish Gürbaşlar Automotive Group. Enterprise Turkey CEO Özarslan Tangün said that in 2018 alone the company will invest around TL 1 billion in Turkey. "We are currently operating with close to 10,000 vehicles in Turkey. We will triple this figure to 30,000 in the next five years. We will make a large part of the said TL 1 billion investment as vehicle investment. In addition, we will also enlarge our offices across Turkey. On the other hand, we have made our plans considering Istanbul's new airport. We intend to carry out operations within the airport as well," he added. Tangün also remarked that within the scope of their plans, they aim to triple the number of their existing 50 offices in the country over the next three years, adding that they also aim to increase their penetration, especially within city. The daily car rental sector in Turkey registers an annual growth of around 10-15 percent, Tangün continued. "We expect this figure to increase in the upcoming period. As for us, we are growing much above the industry. We expect 40-50 percent growth this year. We closed 2017 with a turnover of TL 500 million." Enterprise Turkey also aims to raise its turnover to TL 3.5 billion over the next five years. "Our cooperation with THY is very important at this point. We can say it is our biggest cooperation in Turkey. We also have cooperation with Türk Telekom, Anadolujet, Miles&Smiles and various banks," Tangün noted. Enterprise Turkey has the largest upper segment car, sport utility vehicle (SUV) and hybrid fleet in Turkey, according to Tangün, who said the company's investment in this area will continue. "The tourism sector is very important for our business. There is a revival in tourism this year. We also see this in our own reservations. Compared to last year, both booking and car rental figures have increased significantly," he added. 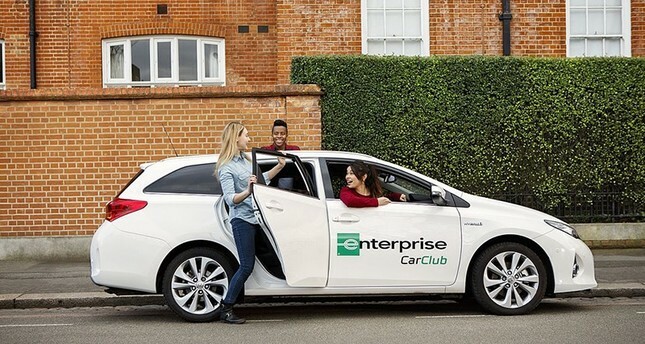 With its global subsidiaries and independent franchises, Enterprise Holdings embraces Enterprise Rent-A-Car, National Car Rental and Alamo Rent A Car brands. THY Chairman Ilker Aycı said they were very pleased with the performance of the Enterprise. "The agreement that we initiated last year and progressed on a global scale is very important in terms of both the benefit of the Turkish Airlines and the quality of service that we will offer our passengers," THY Chairman Aycı said.